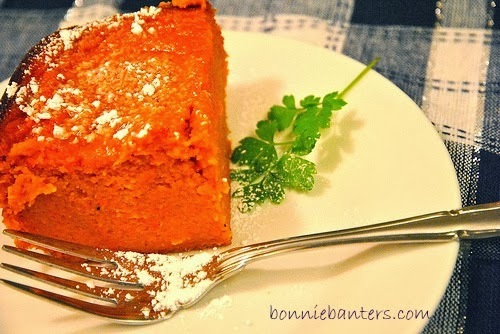 Bonnie Banters: Carrot "Souffle" Casserole ~ Adapted From The Famed Piccadilly Southern Cafeteria! 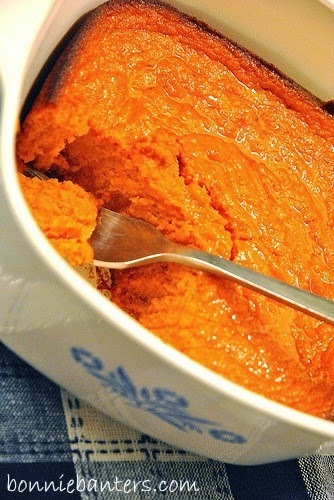 Carrot "Souffle" Casserole ~ Adapted From The Famed Piccadilly Southern Cafeteria! This "souffle" has been floating around my recipes-to-be-made file for a while. Shame on me, because all this time we've been missing out of this fantastic dish! It's an excellent imitation of a very popular side dish from the famed Piccadilly Southern cafeteria. I think it's actually a little lighter than the restaurant's version; and, naturally, I've done my "spin" on it. Place the carrots into a 2 qt. saucepan and cover with cold water. Add the salt and boil the carrots until fork tender (approx. 20-30 minutes). Drain the carrots and place into a food processor. Add the butter and process until the butter is melted. Add the remaining ingredients and process until smooth. Cool approximately 15-20 minutes and serve warm or at room temperature. Right before you serve, sift a little powdered sugar over the top of the casserole for garnish (optional). I *love* this kind of dish--I will have to try it. Beautiful! Hi Regina, This is delicious, and it is a sweet casserole (carrots are sweet). I've not cooked with turnips; but I didn't think they were sweet. So, I'm not sure they'd work in this particular casserole; however, you have more experience with them. For a Southern Gal, you should be up on turnips? We love them and wish we had some in the garden this year but not. I never tasted a turnip before I met Kenny and no, turnips are not sweet but have kind of a tangy taste, hence my thought on combining the two, sweet and tangy! What's your thought??? Regina Gonna try it! LOL...You'd think, wouldn't you? My mother was from Southern California, and she didn't cook a lot of Southern (USA) dishes...turnips being one of them. Funny, I've acquired a taste for a lot of things now that I'm older...I should give turnips a try. If you feel they'd work, I'd say go for it...sounds pretty unusual...let me know! There is a similar recipe in our local Jr. League cookbook...and it's marvelous! I'll have to pull it out and compare the two...yours looks terrific! Hi Liz, Thanks for the extra effort in making sure your comment went through! I did my spin on the recipe I found...I would like to know if the recipes are similar. I know you're not from the South; but maybe someone in your Jr. League is or obtained it through a Southerner. You're right...it's just so delicious! This looks like a perfect recipe for fall and Halloween, and definitely a great way to get kids to try carrots. I had some similar to this at The Virginia Diner. I'm hoping it'll be just as good! This is one of two of my top hits on this site! I'm sure you'll love it as much as we do. Thanks for dropping by. Tried the 1st time without the spices to mimic a local restaurant. It was awesome. Tonight I made it with Stevia since I'm trying to slim down. Also used gluten free flour and did use the spices this time. It turned out ok, but I can taste the stevia. If you want to use stevia, I would suggest using less than what the recipee calls for and adding more vanilla. Thank you for trying one of the most popular recipes on my blog and sharing your experiences. I feel the spices make the recipe, but I do believe each to his own. Please visit often!